Read reviews, including new praise by Shaul Stampfer in Religious Studies Review. Listen to Q&A and the story of the book here. The Babylonian Talmud (Bavli) is a symphony of hundreds of voices, including legal rulings, folklore, biblical interpretations, and rabbinic legends. Each of these voices was originally issued in a distinct generation but was only "captured" and frozen in time by the Talmud’s editors, who lived during the fifth through seventh centuries C.E. Reconstructing the Talmud, by Joshua Kulp and Jason Rogoff, introduces the modern Talmud student to the techniques developed over the last century for uncovering how this literature developed. Opening with an extended introduction outlining the methods employed by scholars to engage in such analysis, Reconstructing the Talmud proceeds with nine examples concretely demonstrating how such methods are applied to actual passages from the Bavli. Sorting out the layers of the Bavli, understanding each layer within its cultural and historical context, and comparing it with earlier sources, reveals a dynamic world of change, debate, halakhic diversity and development far richer and more nuanced than that which is evident in the static and fixed text of the printed edition. Reconstructing the Talmud introduces the reader to the world of academic Talmudic research and opens new venues of exploration and understanding of one of the world's great literary treasures. Where can I order a copy? You can order directly from Hadar Press. Recent decades have seen dramatic changes in the ways that Talmudic texts have been analyzed and in the understanding that we have about the process through which the Talmudic canon came into being. However, it is not a simple matter to master these new methods, and awareness of these new approaches and the novel conclusions to which they lead has been limited to an academic audience. This volume is intended to rectify this situation, and the authors are remarkably successful. Each of the nine chapters in the books deals with a different text and employs a different method of analysis. The first chapters deal largely with the literary and source analysis while later chapters deal with the potential of femi- nist approaches, examination of texts in light of the Greek context or, in certain cases, in light of other contexts such as the Babylonian-Zoroastrian. 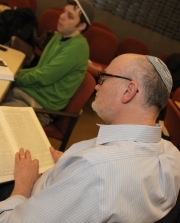 The book does not take previous rabbinic knowledge for granted and provides suitable introductions for novices without being condescending or boring for more advanced students. Veteran students of rabbinic lit- erature will be surprised at the ability of the authors to present complex Talmudic texts so clearly and to enable beginners to understand sophisticated approaches in Talmudic study. This volume has immense potential for anyone who wants to understand Talmud and can be used in a classroom situation and also for independent reading. It is a remarkable achievement. The work of academic Talmud scholars has for too long been cloistered within the inner circle of the initiated. Reconstructing the Talmud invites the English reader to savor this intriguing discipline, within the context of important halakhic and aggadic themes upon which new light has been shed. The school engendered by the groundbreaking work of the colossi Jacob Nahum Epstein and Saul Lieberman has been a beehive of activity for a generation. Joshua Kulp and Jason Rogoff provide a beautiful distillation of the scholarly tools and their application to texts and subjects central to our interests. A must for the intellectually curious Talmud student, this well-written and engaging work has the capacity for providing a quantum leap towards opening the most fascinating development in Talmud scholarship to a deserving audience. Kulp's and Rogoff's Reconstructing the Talmud presents a superb introduction to the academic, "critical" study of the Babylonian Talmud. It beautifully bridges the Israeli and American academic worlds. Different from most existing introductions this book does not merely discuss the various theories of the making of the Talmud. Rather, as a critical commentary it models the ways in which awareness of such theories aid the study of the Talmud for beginning students. The thoughtful didactic presentation of the commentaries to the wide range of Talmudic passages selected for this book is simply inspired: clearly the fruit of many years of teaching. Kulp and Rogoff have rendered what will turn out an indispensable service to the anglophone readership seeking serious engagement with the Talmud.